Many Might ask...Why Donkeys? 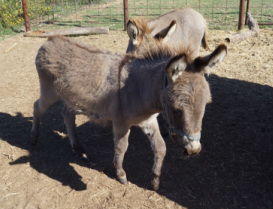 When we took in our first few donkeys, we new nothing of them..just that they were adorable..As we began to grow our herd of both mini and standard donkeys, our thought was to bring home Donkeys in need , there are so many!! work with them and rehome them with a job to do..But some need to stay..some of the girls we took in were mostly aged, they didn't need to be rehomed again..they needed a life of love and care...they needed this to be their home..but Why Donkeys? Do to high hay prices, We are sadly not taking any more Donkeys at this time. We need to be able to afford to feed everyone this winter. This pretty girl is aprox. 10 years old. Our first donkey, Elmer purchased Josie and her jack baby Oscar which started our love for Donkeys and heart to save them all. Oscar is Josie's jack. He now is a gelding... My daughter, Jessica has done a great job with him..Oscar leads, steps up, allows hoof cleaning and is learning to jump. Jessica has the goal of teaching him to pull a cart...He is a sweet boy. Agatha is sweet. I love her so much. She and Christy we found in a junk yard of sorts, no food or much graze. They were eating dog food. When we got them home they wanted nothing to do with any of us. Agatha didn't take long to warm up to us..and loves to be groomed and hugged and kissed.. Christy ( pictured below) took much longer..was VERY hand shy. Now will lay her head in my arms while I hum to her and closes her eyes..She still will not allow feet cleaning easy but we don't rush her or any of them..Both were found bred, Agathas Jenny was rehomed at a year old, to a wonderful place and Christys Jack remains here as a geld. (Troy) ..These two girls are at their forever home. This is VP...she is so cute at only 30 inches at the withers..a sweet lovable girl now..not a great pic..not sure what she is doing with her face LOL..
will only be rehomed with her mom Sadie..
Minnie is a sweet gal...one of the older of the bunch. As sad as it is to see Minnie and Carmela go, I am so excited for them. They are going to be yard art that they can pet LOL..easy loving life with a very good family...So happy!! this sweet boy can go with any of the ladies as a companion.